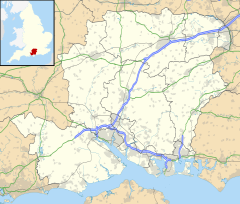 Leigh Park is a large suburb (population 27,500) of Havant, in Hampshire, England. It currently forms the bulk or whole of four electoral wards: Battins, Bondfields, Barncroft and Warren Park (generally referred to as 'The Warren'). Staunton Country Park lies on the northern edge of Leigh Park, also within the Havant boundary. While known to many as a post-war housing estate, Leigh Park has existed since much earlier. As early as 1750 mention was made of a farm on the site in a will of that year and local historians consider it likely that a farm existed there around 100 years earlier. Leigh Park Estate may have been formed with the building of Leigh House by the then owner Samuel Harrison some time before 1791. The stables, walled garden and coach house of this somewhat grand residence still survive today as part of Staunton Country Park. The estate encompassed decorative planting, lakes and follies and was described as “ one of the most beautiful spots in the county” in 1826. Leigh Park was re-developed as a new suburb for those made homeless in Portsmouth by bomb damage which occurred during World War II and to enable the new roads and parks of Portsmouth to be built. The land for the estate was purchased by Portsmouth City Council from the Fitzwygram family in 1944; work started on building in 1947 and the first residents moved in during 1949. The first shops opened in 1952 (in Stone Square) and Park Parade, Greywell Shopping Centre which is Greywell Road (usually referred to as just Park Parade), the main shopping area in Leigh Park, opened in 1955. The majority of homes in Leigh Park were built by Portsmouth City Council, not Havant Borough Council through a financially underwritten cooperation with the former Havant and Waterloo Urban District Council. Most Leigh Park tenants of social housing pay rent to the properties' owners Portsmouth City Council or Hermitage Housing with headquarters in the city. Residents are liable in council tax to Havant Borough Council who provide local services and collect the Hampshire County Council proportion. Construction of the estate was not fully completed until the early 1970s, although most of the houses in the area were built by 1960. Hermitage Housing commissions most new housing in Leigh Park. Barratt Homes is currently building on the former Procter & Gamble site in the centre of Leigh Park. Leigh Park was one of the largest wholly council estates in Europe however following the ongoing right to buy many of the properties are privately owned. In 2004, Leigh Park made the news when a gang stole more than £100,000 from the Nationwide Building Society and a man sleeping on a bench was set on fire, in a separate incident. The main shopping precinct is served by Stagecoach Bus Routes 20, 21, 23, 37 and 39, which provide links with central Havant (with some services continuing to Portsmouth and the main area hospital). FirstGroup Runs the 27 service through the estate between Rowlands Castle, Havant and Emsworth. The suburb is within the Borough of Havant and includes the Battins, Bondfields, Barncroft and Warren Park wards. Leigh Park is served by the Havant MP Alan Mak, a Conservative. Leigh Park contains several primary schools: Front Lawn, Trosnant, Riders, Sharps Copse, Park House, Warren Park, Barncroft School and St Albans C of E.
Leigh Park is currently served by three secondary schools: Havant Academy (known as Wakefords Secondary School when it opened in 1970 and latterly Staunton Community Sports College until 2009), Park Community School (known previously as Broomfield Secondary School, when it opened in 1958, and Broomfield Comprehensive School until 1988) and Prospect School, built in 2008, an education centre for children with learning and social disabilities. The West Leigh area was also served by Oak Park Secondary School on Leigh Road (close to the junction with Crosland Drive - now demolished), from its opening in 1957 to its closure in the late 1980s. Pupils from that area then attended Warblington Comprehensive School situated some distance from the area on Southleigh Road, Denvilles. Between 1958 and 1960 Havant Grammar School had shared the Broomfield Secondary School site on Middle Park Way until it moved to its own, new buildings on the corner of Barncroft Way and New Road. The title Havant Grammar School disappeared with the arrival of the comprehensive school system and it became Havant College a sixth-form college in 1974. The suburb's main non-league football side is Havant & Waterlooville who currently play in the Conference South, two divisions below the Football League. The team's main claim to fame is reaching the FA Cup fourth round in the 2007-08 season when they twice took the lead against Liverpool at Anfield before finally losing 5-2. Havant Hockey Club play at Havant College on Barncroft Way (just on the outskirts of Leigh Park). The team were National and European Champions in the 1990s. The street High Lawn Way just beyond the Crown Bingo Hall also offshoots onto a bowls club, two tennis courts and a common playing fields and children's play area. Leigh Park boxing club is based at the community centre. Roland Orzabal (b. 1961). Co-founder of Tears for Fears, composers of popular songs 'Mad World' and 'Everybody Wants to Rule the World' was raised in Leigh Park. ^ "Boy, 17, charged over burning man". BBC News Online. 2004-06-14. Retrieved 2012-09-01. ^ "Leigh Park community Centre is saved by charity". The News (Portsmouth). 8 March 2016. Retrieved 4 October 2018. This page was last edited on 21 February 2019, at 01:09 (UTC).